This post was created in collaboration with Walnut Hollow. I was provided with products to complete this challenge, all details, excitement and commentary are my own. Are you ready for another Create and Share Challenge? 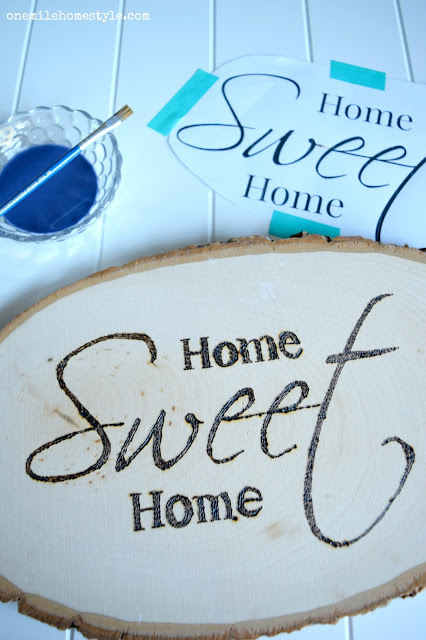 This time around, I joined with 28 of my blogging friends and Walnut Hollow to show off all kinds of fun DIY wood home decor. There is list of all their amazing projects at the end of this post; grab a drink, take some time, and check them all out! 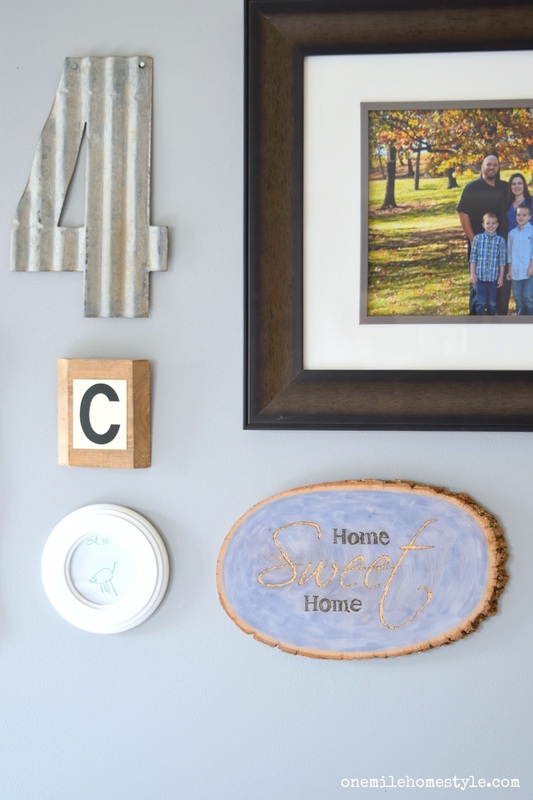 I recently updated the look of our family room gallery wall, and this golden home sweet home art added the perfect little bit of rustic texture, and fun color. I have to preface this with the fact that this was my first ever woodburning project, and now I can't wait to do more! It was so fun, and so easy! So, the first thing I did was create and print out my text on plain white paper. I played around with the fonts for a while before I found a combination I really liked. To create a traceable template on the wood, I rubbed chalk all over the back of the paper (in hindsight, colored chalk would have been a better choice), taped the paper chalk-side down to my woodslice, and then used the end of a paintbrush to trace over the letters. Carefully remove your paper to see your template. 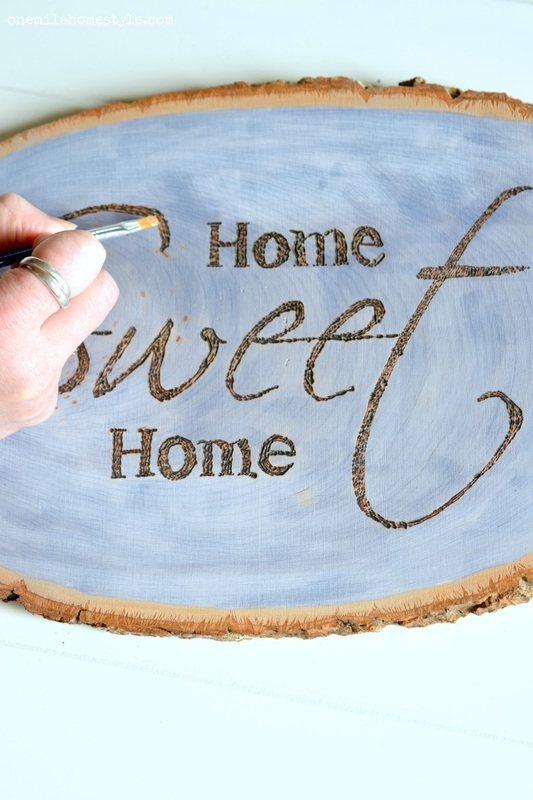 Definitely start with a scrap piece of wood to practice your wood burning technique before you start on your project wood. I found that working backwords, from right to left, kept me from wiping the chalk off and worked better overall. The number one pointer I have is don't get caught up in making this look "perfect". There are going to be minor imperfections, and that's part of the beauty in this type of project. Once I was happy with the lettering, I mixed up my own colored wood stain (tutorial to come), and applied it to the entire wood slice. The wood really soaked up the stain, but I still gave it a few hours to fully dry. Then it was time to really make this wall art shine! 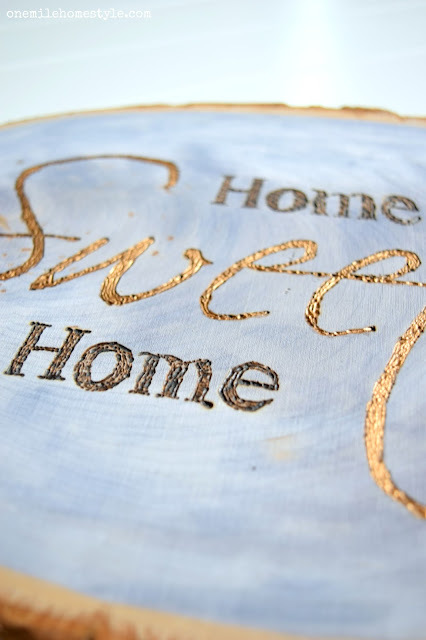 Using my favorite color of Rub n' Buff, Antique Gold, and a small paintbrush, I filled in the letters of the word "sweet". 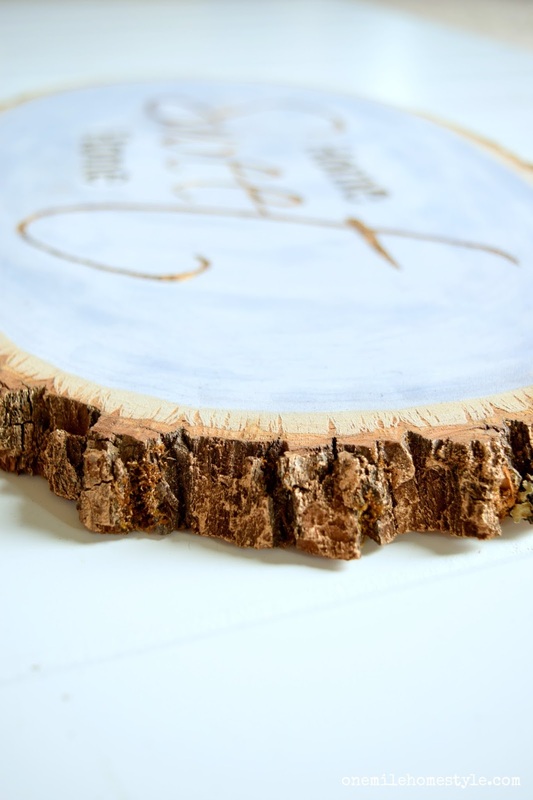 This is what takes this little piece of art from simple to show-stopper! Since I already had the Rub n' Buff out, and a little extra gold never hurt anyone, I added some golden touches to the bark edge too. It's just enough to be noticeable and fun, but isn't super blingy either. 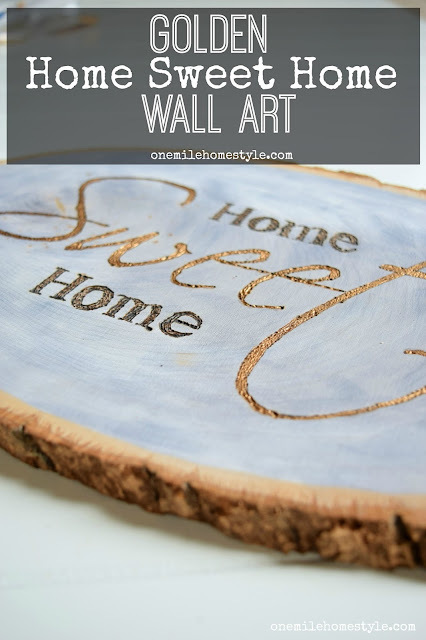 The last thing to do was add a picture hook to the back, and hang my new golden home sweet home art on the gallery wall. It looks so pretty when the sun hits it in morning, and wood adds a warm rustic touch. This was such a fun little project, and trying out wood burning was a blast! 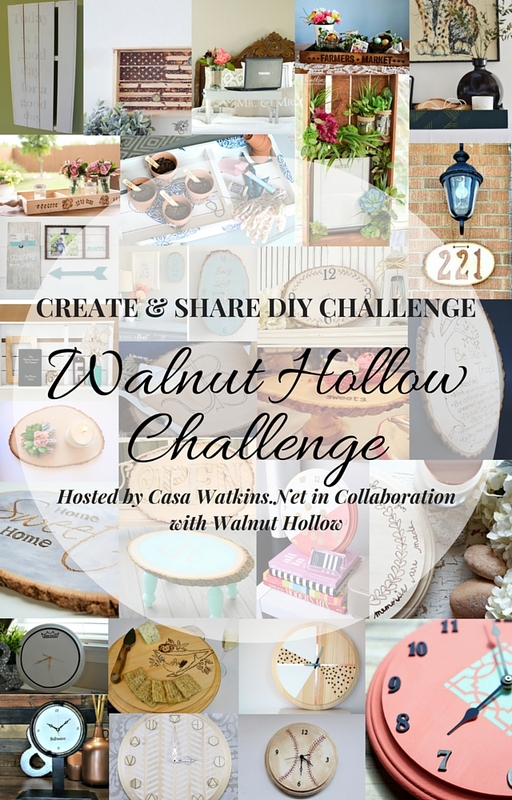 I highly recommend giving it a try, and if you are looking for supplies for decor projects in your home, I highly recommend checking out Walnut Hollow, I'm sure you will find more than enough supplies, and inspiration! And now for even more inspiration! These ladies knocked it out of the park with all these great projects, I know these will be showing up on my Pinterest boards for sure! Love this sign - especially the way you used the gold on the lettering and the edges. So pretty - sophistication with rusticness - perfect. That gold and the wood together is perfection!!!! This is such a beautiful project, Stephanie! I love how you used the wood burned lettering, gold, and blue all together. Awesome job! Thanks Tiffany! I really love the gold on the lettering too! This is beautiful! What a great technique with the burner! I love the way it turned out! Thanks April! I think I am addicted to the burner now! This is really beautiful!!! Love the font and how Sweet is styled! 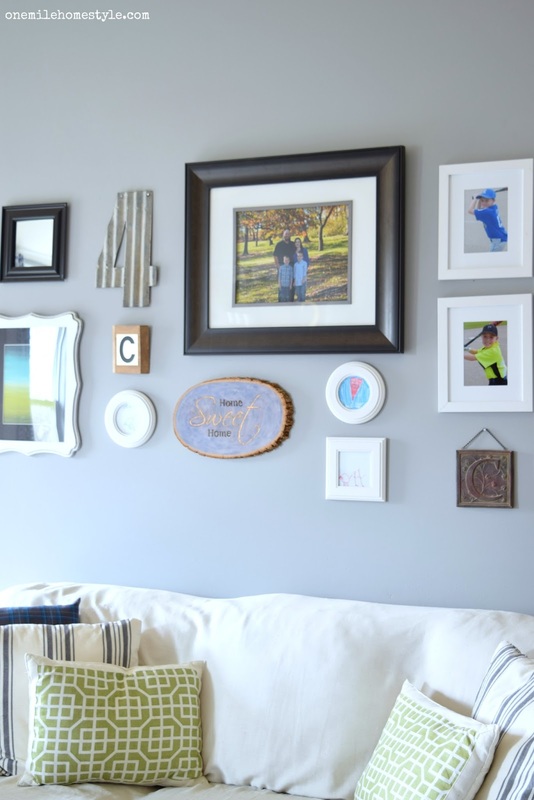 Such a pretty addition to your gallery wall. Great transfer method! I must try it. Thanks Meghan, the chalk transfer is so easy to do! Thanks Amy! I am loving the gold accent too! Love the gold detail, that turned out so good! Stephanie this is sooo pretty!! I love the gold accent. It looks so great with the paint you placed on the basswood! 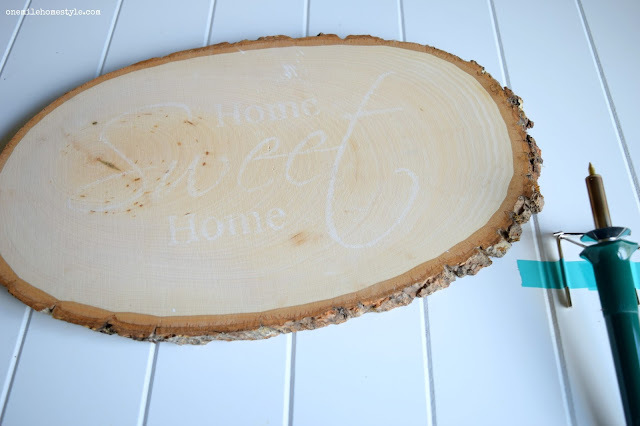 Thanks so much for showing us another great One Mile Home Style creative DIY project!